Ascot and Cheltenham might have evolved into the great gladiatorial theatres of racing. But our sport would be nothing without Newmarket. Headquarters, as the diehard purists amongst us prefer to call it, remains the beating heart of racing. So it was fitting that celebrations to mark the 350th anniversary of the organised establishment of the sport on the Heath reached a crescendo with a captivating July Festival last week. Newmarket might have lost its Champion Stakes. Its awkward geographical location might be plaguing attempts to boost attendances. And distorted publicity relating to drink and drugs might be unfairly tainting the town’s image. But Newmarket is still the home of two terrific courses, two enduring Classics and nine Group One races. It is still the home of 70 stables, housing 2,000 thoroughbreds exercising on the biggest expanse of gallops, stretching 70 miles, that you can find in the world. It is still the home of the National Stud, the only commercial, working stud farm in the UK, 80 other stud farms and Tattersalls, the leading bloodstock auctioneer in Europe. It is still the home of the National Horseracing Museum and the largest and most sophisticated equine hospital in Europe. Say what you like about the town’s High Street on a Saturday night, about the Newmarket Nights concerts and the long home straights that might yet save binocular companies from bankruptcy. Without Newmarket, racing in this country would be a poorer pastime. And the July Festival, mark 2016, reflected such with three perfectly balanced cards that offered the lot, from informative two-year-old maidens, through competitive handicaps to intriguing Group contests. Also on show was clear evidence that the Jockey Club, under whose auspices Newmarket operates, has worked hard on the 350th birthday message, mixing events, activities and soundbites as part of an impressive season-long package. It was way back in March 1666 when King Charles II rode on to Newmarket Heath to restore his love for racing and lay the foundations from which the sport of today can confidently trace its roots. Even the Rowley Mile stems from Charles because his nickname, Old Rowley, is said to derive from his likeness to a stallion of the same moniker -- on account of the large number of illegitimate children the king sired! The royal family’s links with the sport are, of course, as healthy as ever. But much water has flown under the bridge in the last 350 years, which was so aptly reflected as the town’s oldest race, the marathon Newmarket Town Plate, initiated by Old Rowley himself, launched last week’s meeting. It was impossible not to let out a wry smile as the race finished with not King Charles galloping up the home straight but rather the latest member of racing royalty, Sheikh Fahad Al Thani, aboard the winner, Almagest. Quite what King Charles would have made, or the Qatari guru does make, of the ongoing kerfuffle surrounding the delightful July Course’s current flagship race, the July Cup, is anybody’s guess. Saturday’s renewal was as hot a Group One sprint as it was possible to conjure up even in the wildest of dreams. So what a shame that it had to be compete for preview-and-review time and space with other big races at other big meetings at other big tracks on the same day. In the racing media, I have detected a leaning towards reluctant acceptance of what has been lazily termed Super Saturday, mainly because ITV may well lap up the chance to showcase rat-a-tat-tat action from Newmarket, Ascot, York and Chester in the space of a couple of hours when the channel takes over terrestrial TV coverage next year. But this is a serious slap in the face for punters and racegoers, who haven’t the time to digest, never mind study, so much high-quality fare. Which, in turn, severely reduces the business bookmakers receive. Which, in turn, has a damaging effect on the sport’s finances. Coral have already made it clear that turnover on the John Smith’s Cup at York, the Summer Mile at Ascot and the Bunbury Cup, back at HQ, could have been doubled if they were held on different days. Significantly, the combined attendance-figure for the day was also much reduced on last year, suggesting there just aren’t enough committed racegoers to go round on such an action-packed afternoon or, like me, they gave out a sigh of ‘stuff it’ and chose to watch it all unfold on the telly. Of course, Newmarket itself triggered the congestion when altering the shape of the July Festival which, until 2005 had been a Tuesday-to-Thursday meeting. After five years as a Wednesday-to-Friday offering, it shifted forward another day to embrace Saturday in 2011 and has stubbornly refused to budge since, partially, I suspect, because the track remains utterly peeved at the disruption of its autumn fixture-list to accommodate the creation of Champions Day at Ascot. Given that HQ bosses can now point to a steady rise in crowd figures for July Cup Day too, don’t expect a change in policy very soon. DEADLINES are the curse of journalists. Particularly when they come and go literally minutes after someone like Kieren Fallon announces his retirement. Last week’s column was robbed of the chance to pay tribute to Fallon. I do so now, and with knobs on. His supreme ride on KRIS KIN to win the 2003 Derby cannot, and must never, leave my mind. Let’s hope, as he fights the cruel demons of depression, it never leaves his either because, within that inspirational display of horsemanship, is all Fallon needs to remind him he was one of the greatest jockeys of the post-Piggott era. While most racing diaries are counting down the days to Ascot’s King George meeting, swiftly followed by Glorious Goodwood (or the Qatar Goodwood Festival, as it is now branded), it would be remiss to bypass the annual Go Racing In Yorkshire Summer Festival, which gets under way this Saturday. 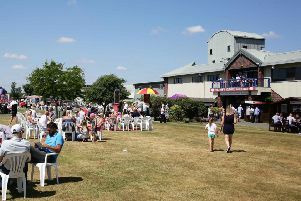 Now in its ninth year, the eight-day festival aims to showcase the unique charm and character that Yorkshire racing has to offer and features action from all of its tracks bar Wetherby, where a new grandstand is being built. It’s a superb initiative, coinciding with the start of the school summer holidays, so why not pop along to one of the meetings? They start at Ripon, followed next week by action from Redcar, Beverley, Catterick, Doncaster, Thirsk, York and Pontefract.